Looking for the perfect baby wipes that are sensitive, soft, durable, effective, and reasonably priced? Us too! Every year we put over a dozen sensitive baby wipe options to the test, evaluating them on ourselves and on newborns, toddlers, and bigger kiddos. We research the ingredients on the Environmental Working Group's (EWG) safety database, and compile all the results into our annual baby wipe reviews and rankings. Our top 5 results are listed below, followed by in-depth reviews of nearly a dozen different baby wipe options. This year, to review and rank the best baby wipes for sensitive bums, we got together 5 moms. Two with a newborn, one with a 10-month-old, one with a 15-month-old, and one with a 2-year old that was beginning potty training. These moms did a hands-on testing of 13 different major brands of baby wipes. These included: Bloom Baby, Pampers, Huggies, Target Up & Up, CVS, Amazon, YHYH, Seventh Generation, Walgreens, Burt's Bees, and Water Wipes. We also included some relatively new brands only available through smaller local stores. The moms felt them, smelled them, and used them to clean up wet and soiled diapers. We also used them on ourselves to check out how they feel in terms of sensitivity, oils, and abrasiveness. We looked up each and every ingredient for each diaper wipe, checking its hazard rating in the Environmental Working Group's (EWG) cosmetics database. For each of the best baby wipes we review, we detail any hazards associated with their ingredients. After several days of research, we came to a verdict, and found the best baby wipes of the year! For more details about how we evaluated the baby wipes, scroll to the bottom of this article. Here are the Best Baby Wipes of 2019! 1. 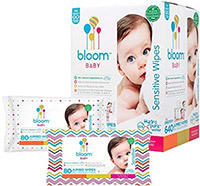 Bloom Baby Jumbo Sensitive Wipes. About 7 cents per wipe. These are relatively new to the baby wipes market, and are definitely one of the best available. We first tested these for our 2017 list and were amazed by how great they were. They smell great, they are durable and soft, they are large enough for several passes over a dirty bum (about an inch wider than most wipes), and the company making them (Bloom + Kind Inc) takes "sensitive" very seriously. These best baby wipes are 98% natural, without any of the harsh chemicals found in many wipes (like sodium lauryl sulfate, alcohol, chlorine or ammonium), but still contain an effective antimicrobial to make sure things are getting clean down-under. Made in the USA, these baby wipes are not only sensitive, they are also hypoallergenic and have never come into contact with nuts, wheat, or gluten. In our tests, even the most sensitive bottoms didn't show any signs of irritation or diaper rash after a few days of using these wipes, which is a pretty good testament to their effectiveness and sensitivity. The texture of the wipe is soft and flexible, with a little bit of stretch so the wipe won't tear very easily. In fact, in our testing, these baby wipes were the hardest to tear overall, possibly due to the intricate quilted design and texture that you can see when you look really close at the baby wipes themselves. That unique texture is one of the best features: while most other wipes are slick/smooth and even a bit "mushy" at times, this one adds a simple texture that helps immensely with cleanup! With pee, cleanup was extremely easy. With a poopy diaper, we folded them in half to ensure there was no breakthrough, and they were very effective. They are jumbo-size wipes (about 8" x 7"), so even after folding them in half, there is plenty of surface area to wipe effectively while keeping your hands clean. We also liked the resealable packaging, which made it easy to keep the baby wipes fresh and moist without too much hassle. In our test, we only found one minor negative: when you pull out a wipe, the next wipe comes out of the package a bit too much before letting the first one come loose; if you leave it there without sealing it back into the pouch, a decent portion of that next wipe will dry out after a few hours. This isn't much different from most of the other options, and we're grateful that the next wipe is indeed coming out in the first place (which is more than we can say for some other options!). The product design folks at Bloom might want to check out the packaging and folding that Pampers is using for their new Aqua Pure wipes, which is a fantastic design (the Aqua Pure wipes are so-so, but they dispense beautifully from the flip-top packaging). Here are the ingredients for the Bloom Sensitive Baby Wipes, along with the EWG hazard rating (from 1 to 10, with 10 being highest hazard): purified water, olus oil (2), glycerin (2), lauryl glucoside (1), polyglyceryl-2-dipolyhydroxystearate (1), glyceryl oleate (1), dicaprylyl carbonate (1), comfrey extract (1), olive oil (1), phenoxyethanol (4), and potassium sorbate (3). So those are very low hazard ratings overall by the EWG, though phenoxyethanol (the anti-microbial) and potassium sorbate (preservative) are rated as a moderate hazard for irritation and allergic reactions, so keep that in mind if you're dealing with a highly sensitive bum. Overall, these are excellent sensitive baby wipes, with a soft and gentle feel, and good overall ingredient profile; though the price is a bit higher than its main competitors and the packaging isn't ideal. Interested? You can check out these Bloom Baby Wipes here. 2. Honest Company Sensitive Baby Wipes. About 6 cents each when you buy a larger box of wipes (like a 288-count box). The Honest Company is known for making very high quality and environmentally responsible products, but they also tend to be a bit more expensive than comparable products. These baby wipes are super soft and gentle, and they contain some great fruit and plant extracts to gently cleanse your baby's bottom. Importantly, we found these wipes to be very sensitive, and they did not cause any rashes on any of the babies, toddlers, or adults that we tested them on. In our testing, we thought the wipes were strong and soft, and had a nice texture that made them very similar to the Bloom Baby Wipes. Also making them similar is the large size, with each wipe measuring about 7" x 8", which is really quite large. These baby wipes are not made to be flushable, though that never stopped us (we're on city sewer), but they are biodegradable within 60 days. So maybe that's good news for those with composting toilets!? Out of the box, we loved the packaging. Like the new Aqua Pure wipes, the package uses a convenient plastic flip-top that does a great job dispensing and also holding the moisture in when you're not using them. The packaging comes in a few different patterns and designs, like the pictured Blue Ikat, but also a cute geometric pattern option, and one with rose blossoms. That's probably not so important to you, but some parents like that aspect so it's worth mentioning. Some other things we noticed: the packaging is easy to use for one-hand dispensing, the smell is very mild and pleasant, the dotted texture is great for cleaning up poops, and they don't leave behind any noticeable oily film. That's probably because the Honest Company put a lot of thought into the ingredients, and were careful to exclude parabens, alcohol, chlorine (even in the making of the wipe cloth itself, which is made of natural cellulose fibers), phthalates/BPA, formaldehyde, phenols, ammonium, and lanolin. And no animal testing or animal byproducts (the glycerin is vegetable, not animal-sourced), for what it's worth. These hypoallergenic wipes contain only ingredients that are a 2 or lower on the EWG (1-10) hazard scale. Specifically, here are the ingredients for the Honest Company Baby Wipes, and the EWG hazard rating for each (ranging from 1-10 with 10 being highest hazard): Water (1), glycerin (2), chamomile flower extract (1), cucumber extract (1), licorice root extract (1), pomegranate extract (1), masterwort leaf extract (1), decyl glucoside (1), sodium citrate (1), citric acid (2), and silver citrate (2). So there are a couple ingredients that are not ideal, like citric acid (a preservative that can be a bit of an irritant on the skin), and silver citrate (an anti-microbial with a somewhat unknown risk profile). But, there's nothing too alarming to report - and the good news is that there are no harsh irritants, no common allergens, and no dangerous chemicals. Limitations? Well, other than the higher price you need to pay for these excellent baby wipes, the only other thing we noticed is that they aren't quite as thick or moist as some of the others on this list. They aren't dry by any means, but we think they could benefit from a bit more moisture content to help with the wiping. And they aren't super thin either, but I wouldn't use them without folding them in half first. So overall, these are truly excellent baby wipes and are very deserving of this spot on our list, and the ingredients list gives parents peace of mind that they're using high quality, low risk, hypoallergenic baby wipes on their baby's sensitive bum! Interested? 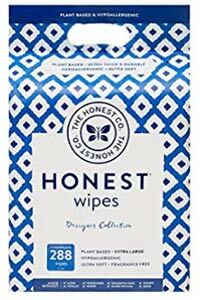 You can check out the Honest Company's Baby Wipes here. 3. Pampers Sensitive Baby Wipes. About 2-3 cents per wipe. These were the go-to wipes for three of the five moms who did this hands-on test. 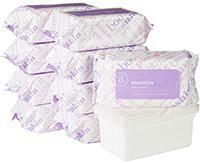 All of them swore by these baby wipes for their mildness, softness, thickness, durability, and scent. And you can't go wrong with the price either when you buy them in decent quantity. You only need one wipe to get the wet jobs done, and likely 2 to get the dirty jobs done. That's because you can wipe then fold and wipe again. Not many other wipes are capable of that without worrying about things soaking through the wipe and getting on your hands. They are about 20% thicker than the Pampers Natural Clean variety, by the way. We also liked how they are very moist which makes clean-up easier. Some options like the Target Up&Up wipes are somewhat dry and rough. The Huggies sensitive are similar to these but not quite as thick, so even though they are cheaper you end up using more. Now for the negatives. First of all any sensitive wipe just isn't going to clean as well as the non-sensitive version; for example, the Pampers Baby Fresh wipes clean better than these, but they're not sensitive and don't do as good of a job preventing diaper rash. Second, we found these #2 best baby wipes among the oiliest wipes on the list. What we mean by that is they leave a thin oily film after wiping, which we are assuming is the castor oil or another moisturizer. Nothing terrible, but in comparison to the Bloom or Water Wipes, it's worth mentioning. So if you're looking for a great, thick, sensitive wipe without any strong odors, the Pampers Sensitive is a good choice. Here are the ingredients for the Pampers Sensitive Baby Wipes, along with the EWG hazard rating for each ingredient (from 1 to 10, with 10 being highest hazard): water (1), citric acid (2), PEG-40 hydrogenated castor oil (3), benzyl alcohol (5), phenoxyethanol (4), sodium citrate (1), sodium benzoate (3), xanthan gum (1), disodium EDTA (1), BIS-PEG/PPG-16/16 PEG/PPG-16/16 dimethicone (3), caprylic/capric triglyceride (1), ethylhexylglycerin (1), bisabolol (1), chamomilla recutita (matricaria) flower extract (1), aloe barbadensis leaf juice (aloe vera, 2). So those are mixed hazard ratings overall, with phenoxyethanol (the anti-microbial) and benzyl alcohol (preservative) as the most concerning for irritation and allergic reactions. So, while they tend to be low risk of irritation, and they are overall great effective wipes, if you prefer something a bit more natural, go with the Water Wipes or Pampers Aqua Pure wipes. Note that the old Pampers Thick Care Sensitive wipes were even better than these, but they were discontinued a few years ago. Interested? 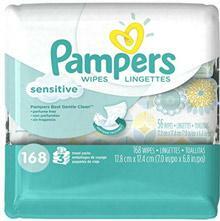 You can check out these Pampers Baby Wipes here. 4. Amazon Elements Sensitive Baby Wipes. About 2 cents per wipe. These are new to the market and are getting some excellent reviews from consumers. This was our first year trying them out, and we were very impressed! These wipes are marketed as sensitive and high transparency for ingredients and ingredient sourcing. The wipes contain about 98% purified water, chamomile flower extract to help soothe sensitive skin, two cleansers (one derived from coconut oil, one unnatural), some pH balancers, and some preservatives to reduce bacteria growth. Note that one of the preservatives is phenoxyethanol, which is also in the Pampers and Huggies, and a potentially irritating ingredient. They do not contain any parabens, alcohol, dyes, phthalates, methylisothiazolinone, and a few other particularly harmful ingredients. So in terms of ingredients, they are quite similar to the Pampers and Huggies, though check out our ingredients list at the end of this paragraph for more details. They are also similar to the Pampers in terms of odor (or lack thereof), size, texture (a subtle dot pattern), and effectiveness. In our tests, we really liked these wipes and think they are on par with the Pampers. However, they were a bit on the thinner side, which was the only drawback relative to ones higher on this list. But overall pretty great for the price, unless you want to move toward a more natural wipe alternative, like the Water Wipes or Seventh Generation wipes. We also want to point out that Amazon is using a unique feature with these wipes: each package has a QR code that you can scan to learn about the sourcing of ingredients in the specific pack you're using. A clever way to increase the perception of transparency, but not certain why it's particularly informative to know whether your chamomile flower extract came from Texas or Indiana. Our package used fibers from China, though to be fair they wouldn't be able to sustain these low prices if they sourced polyester and viscose locally. Here are the ingredients for the Amazon Elements Sensitive Baby Wipes, along with the EWG hazard rating for each ingredient (from 1 to 10, with 10 being highest hazard): Purified Water (1), Chamomilla Recutita Matricaria Flower Extract (1), Disodium Cocoamphodiacetate (1), Polysorbate 20 (3), Citric Acid (2), Disodium Phosphate (1), Disodium EDTA (1), Phenoxyethanol (4), Sodium Benzoate (3). The sodium benzoate (a preservative) is a minor cause for concern, and the phenoxyethanol (another preservative) is a moderate cause for concern regarding irritation and allergic reactions. In any case, we found these wipes to be very effective, soft, and durable, and a great addition to our "best of" list. Will they move up the list in the future? Perhaps, but first let's see how the long-term manufacturing and quality assurance go! Interested? You can check out these Amazon Baby Wipes here. 5. Huggies Natural Care Baby Wipes. About 2 cents per wipe. These are a direct competitor with the Pampers Sensitive wipes, and these Huggies Wipes do quite a good job in that role! One big difference 2 of the 5 moms noticed was the smell. Though they are fragrance-free, there is a faint odor that 2 moms mentioned as a negative; the other 3 didn't notice it. The odor is a bit of a chemical smell, though we have found them generally very sensitive on bums. The sensitivity is due to them being paraben-free, fragrance-free, alcohol-free, hypoallergenic, and very thick. But they do have some other concerning ingredients, including cocamidopropyl betain (an irritating cleaning agent) and phenoxyethanol (a preservative/bactericide); these ingredients have a relatively low allergen profile, but your baby might show sensitivity to them. To be fair, the Pampers wipes also contain phenoxyethanol, and some other potentially concerning ingredients. They do include some aloe and vitamin E to promote soft skin and healing of any mild skin irritation. Two of our moms said these were their go-to wipes, and they loved them. They are thick, durable, soft, and the moms reported no issues with diaper rash. They are a bit less oily than the Pampers, they don't leave the same slight film on your hands, which is good. The texture of the wipes is soft with some imprinted letter H texture; they are so soft and moist that we sometimes found them a little bit "mushy" when dealing with. They do not have the nice woven feel of a wipe like the Bloom Baby Wipes, making them feel a bit slick when sliding across the bum. Here are the ingredients for the Huggies Natural Care Baby Wipes, along with the EWG hazard rating for each ingredient (from 1 to 10, with 10 being highest hazard): Water (1), Phenoxyethanol (4), Amodimethicone (1), Caprylyl Glycol (1), Cocamidopropyl Betaine (4), Malic Acid (3), Sodium Citrate (1), Aloe Barbadensis Leaf Juice (1), and Tocopheryl Acetate (3). So the phenoxyethanol (a preservative) and cocamidopropyl betain (a cleanser) cause some concern for irritation and allergic reactions. Note that Huggies also makes a Simply Clean variety, but they are not a hypoallergenic wipe and didn't seem quite as thick. Interested? 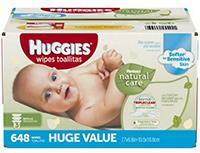 You can check out these Huggies Natural Care Baby Wipes here. 6. Babyganics Extra Gentle Baby Wipes. About 4-5 cents per wipe. Babyganics has a great line of gentle baby products, including top-rated sunscreens, baby washes, and now baby wipes! In our testing, we thought these baby wipes were soft, sensitive, durable, and effective. In most cases, we didn't need to double-up on these to clean up a pee-pee diaper, but we did find them somewhat small and thin. Nowhere near the thickness of the Bloom wipes, or even the Huggies or Pampers wipes. We also found them to leave a nice moist residue without any oily film left on the hands or bum, which is more than we can say for the Pampers Sensitive Baby Wipes. They also seemed to be very gentle on even the most sensitive cheeks and bums, and we didn't notice any increase in diaper rash or other symptoms of sensitivity. Not so surprising given the high quality, fragrance-free sensitive ingredients, including chamomile and several natural seed oils. Check out our hazard analysis of the ingredients at the end of this paragraph. We also didn't really like the odor. We got used to it with time, but the lack of fragrances made for odd smelling wipes, likely from some of the seed oils. Not a bad odor per se, just a little off-putting. We also don't appreciate the misleading connotation of the Babyganics branding, which suggests organic products (which they are not). In any event, if you can handle the price and want an excellent and highly effective (but maybe a bit smelly) baby wipe, this is definitely a great option for you! Here are the ingredients of the Babyganics Baby Wipes, along with the EWG hazard rating for each ingredient (from 1 to 10, with 10 being highest hazard): water (1), chamomilla recutita flower extract (1), vegetable oil (1), glycerin (2), lauryl glucoside (1), polyglyceryl-2-dipolyhydroxystearate (1), glyceryl oleate (1), dicaprylyl carbonate (1), sodium benzoate (3), citric acid (2), potassium sorbate (3), solanum lycopersicum (tomato) seed oil (1), helianthus annuus (sunflower) seed oil (1), vaccinium macrocarpon (cranberry) seed oil (1), nigella sativa (black cumin) seed oil (1), rubus idaeus (red raspberry) seed oil (1). So there are a lot of gentle, low-hazard ingredients that are naturally derived from various plants; but the potassium sorbate (anti-microbial) and sodium benzoate (preservative) can be a mild irritant and allergen. Interested? You can check out these Babyganics Wipes here. 7. Pampers Aqua Pure Baby Wipes. About 4 cents each. These were new to the baby wipe market in 2018, and they've been making quite a splash. 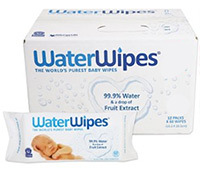 These wipes seem to be direct competition with Water Wipes, emphasizing the fact that they are 99% water, woven with cotton, and free of many common irritant ingredients found in baby wipes (like phenoxyethanol). When we received them for testing we were pretty excited by them! The packaging itself is excellent: they use a typical pouch but with a plastic flip-top dispenser. And it dispenses one at a time, leaving a tiny bit of the next wipe hanging out of the package. If all baby wipes came in this packaging, with this folding/dispensing technique, life would be so much easier! Our first impression of the wipes after pulling them out was that they seemed lightweight and thin, and sized just about the same as most major brands. So not as large as the Bloom Baby Wipes, but not as long and narrow as the Babyganics Wipes. Our second impression was that there was clearly no fragrance added, and what you're left with is a mild chemical smell. Nothing too off-putting, but definitely noticeable. In our testing, they were sensitive and none of our test babies developed any rashes or irritation after use. They were pretty decent with cleanup, especially for number 1. For number 2, they left something to be desired. In addition to being a bit thin for our liking, they were also very "slick" in that they move very quickly across the bum, like an oily slick wiping sensation. So, we weren't really impressed, and think that Pampers needs to consider adding a subtle texture to these baby wipes to help with cleanup. Heck, they could just use the same texture they have on their regular sensitive wipes, and that would help tremendously. It seems especially important to have some texture when the wipes don't have the cleaning power of non-sensitive wipes. Anyway, we were truly excited to try out these new wipes but were left thinking that you can do better for the money. We were also thought thinking that there are still a couple moderate irritants in the ingredients here, so all the "pure" marketing doesn't exactly hold up. Here are the ingredients for the Pampers Aqua Pure Baby Wipes, and the EWG hazard rating for each (ranging from 1-10 with 10 being highest hazard): Water (1), citric acid (2), PEG-40 hydrogenated castor oil (3), sodium citrate (1), sorbitan caprylate (1), sodium benzoate (3), and disodium EDTA. There are some mildly concerning ingredients, including sodium benzoate (a fragrance and preservative), and castor oil (a fragrance and cleanser), but nothing too alarming. The primary downfall is really the thinness, odor, slickness, and lack of texture. 8. 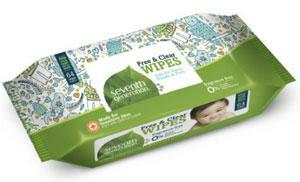 Seventh Generation Free Clear Baby Wipes. About 4 cents each. You can trust Seventh Generation to produce high quality, safe, natural alternatives to major brand baby wipes. These are the original Seventh Generation wipes which had a brief pause due to the release of the Thick and Strong version, which were not well-received by consumers. The Thick and Strong wipes were nice and thick, but people did not like the coarse texture or lower durability. Seventh Generation brought back these original Soft and Gentle wipes, and we're really happy about that. Like most others on this list, these wipes are free of dyes, parabens, fragrances, and alcohol. They are also hypoallergenic wipes and sensitive for baby bottoms. For cleaning it contains coconut acid and citric acid, and to keep things sensitive it contains aloe. It also has some natural preservatives. Our moms noticed that these wipes had a pleasant odor, a nice texture, and they felt good about using something with ingredients derived from natural sources. So why is it not higher on our list? Well, two primary reasons. First, they are not as thick as many of the other options, and one of our moms said that some poop was able to get through during a dirty clean-up, so they had to use more wipes than they wanted to. Of course, this increases the cost when you're required to use more wipes for a single cleaning. Second, given that you have to use more, you would want them to be less expensive. However, they are a bit more expensive than the Pampers or Huggies options, and nearly as expensive as the Water Wipes. Overall, these baby wipes are a great option, and if the cleaning effectiveness were a bit better, they would definitely top the Huggies Natural Care. If you're looking for a wipe you can feel good about, with a great ingredient profile and very low sensitivity, then we definitely suggest these wipes over the Pampers or Huggies. If you're willing to compromise a bit on ingredients in favor of cleaning effectiveness, then go with the Pampers of Huggies. Here are the ingredients for the Seventh Generation Free and Clear Baby Wipes, and the EWG hazard rating for each (ranging from 1-10 with 10 being highest hazard): Water (1), cocamidopropyl pg-dimonium chloride phosphate (1), citric acid (2), quillaja saponaria wood extract (1), aloe barbadensis leaf extract (1), tocopheryl acetate (3), sodium benzoate (3). There are some mildly concerning ingredients, including tocopheryl acetate (a skin conditioner) and sodium benzoate (a fragrance and preservative), but nothing too alarming. 9. Water Wipes Baby Wipes, 99.9% Water. About 5 cents per wipe and the closest thing to natural baby wipes you'll find. When our boys were babies these weren't an option yet, which is unfortunate because parents have said great things about them. In our testing, we found these wipes to be one of the least irritating for sensitive bottoms, a good thick quality with a tiny bit of texture (more would be helpful) to help clean-up, and a great scent. That scent is grapefruit seed extract, which is .1% of the ingredients; the remaining 99.9% is just purified water on a cotton and wool wipe (but see our ingredient update below). That little bit of extract does something great - it gives it a pleasant subtle smell and also helps with clean-up and preserving the wipes. These are technically unscented wipes, but that little bit of extract they added for cleaning actually provides a tiny scent. Other baby wipes contain all sorts of chemicals, many of which we cannot (and do not care to) pronounce. These are chemical-free, hypoallergenic wipes, and are really great at reducing the risk of diaper rash. Our reviewers thought they worked really well and did a great job of clean-up. They also commented that it was nice not to have your hands and baby smell like chemicals after a diaper change. There were a few cons, however. First, the wipes were a bit harder to pull out of the package than the competition; on the one hand this is great because you won't accidentally pull out more than you need, but on the other hand, it makes it difficult sometimes during a messy clean-up. We suggest pulling out 2-3 wipes before unfastening a soiled diaper! Also, because this is a water-based option, the water tends to settle a bit at the bottom of the package, making the top wipes less moist then the bottom ones. There are a few ways to solve this issue, but the one we found helpful was to simply turn the package over once in a while to get the moisture moving throughout the wipes. Finally, we didn't find them quite as good as the Bloom wipes for cleaning up the messy stuff, mostly because the wipes are smaller and feel "slick" when wiping, they don't have a good texture to help grab the messy stuff. But if you're looking for something that truly is just a cotton wipe with 99.9% water, then that's a reality you'll need to deal with! Here are the ingredients for the Water Wipes Baby Wipes, along with the EWG hazard rating (from 1 to 10, with 10 being the highest hazard): purified water (1), citris grandis (grapefruit) seed extract (3), and benzalkonium chloride (trace amount, 4). The grapefruit seed extract has a moderate rating, given it can be a slight irritant and allergen; and benzalkonium chloride is an anti-microbial with a moderate hazard rating, though it is only present in trace quantities (0.002%). The original version of this wipe was larger than the current version, and it also didn't contain that anti-microbial ingredient; over the past year, these waterwipes baby wipes have fallen from second place to this relatively low position on our list. Overall, these are an excellent addition to our best baby wipe list, aimed at parents who want the best and most sensitive wipes for their baby. 10. 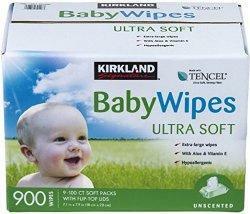 Kirkland Signature Baby Wipes. About 3 cents each. Anyone who has been to Costco has seen the Kirkland Signature, the mid-range house brand that has been making consumers happy since 1995. These were a big surprise for us; not one of our moms was a Costco customer, so they hadn't seen these wipes before our test. There are a lot of good things going for these wipes. They are hypoallergenic, alcohol free, unscented, made of renewable resources, and contain aloe and Vitamin E to help moisturize and soothe irritation. We thought they were very soft, thick, and absorbent. Like the Huggies, however, 3 of our moms noticed an odor that wasn't as pleasant as the Pampers or as non-existent as the Water Wipes. Though these wipes are free of alcohol and are listed as hypoallergenic, they do contain some unfortunate artificial preservatives that some moms report are harsh on bottoms. Note that a few years ago they were even worse, so some kudos to Kirkland for improving the safety of their wipes. Overall, these are truly good thick wipes. An average of ten diaper changes a day for the first 6 months? About 2 wipes for wet, 5 wipes for soiled bums, that's about 30 baby wipes per day. Over 200 per week, nearly 1000 per month. Not to mention all the wipes you'll use for cleaning little hands and faces. With that much contact with your baby's bottom (and hands, arms, and face! ), you better make sure that when you choose the best baby wipe it is soft, sensitive, and durable. And it's not enough to have a great sensitive baby wipe, you also want to make sure that you're using one of the best diapers that will reduce rubbing, abrasion, and rashes from moisture. What we suggest: We recommend getting a better-quality baby wipe, one of the sensitive options, that will be a bit thicker and give you better overall clean-up. You pay a bit more for better wipes, but you'll also use fewer and your baby will be less likely to develop diaper rash from chemicals, fragrances, and excessive wiping. That will save you money and stress in the long run. At a rate of 1000 wipes per month you'll be wondering whether you should go with some of the cheaper options: Target Up & Up, CVS brand, etc. The problem is, while we like to believe the brand of wipes doesn't matter, and those options sometimes do a good job with sensitivity and fragrance, they also tend to be very thin and easily break in your hand while wiping. That simply results in using more wipes because you need to double-up to protect your hands against the nasty stuff. Harmful Chemicals: It's a difficult compromise between how effective a wipe is, versus the number of potentially harmful chemicals in its ingredients, like chemical preservatives, fragrances, parabens, harsh cleansers, and more. The most effective baby wipes at cleaning up #2 and making your baby smell fresh, tend to also include more chemicals that might ultimately irritate your baby and cause rashes. In terms of the best baby wipes reviewed above, we counted the frequency of "moderate hazard" ingredients (based on EWG guidelines). The Honest Company, Bloom, Babyganics, Seventh Generation, Aqua Pure, and Water Wipes came out as clear winners, each only having a couple moderately hazardous ingredients. In contrast, the Amazon Elements Baby Wipes had 3, the Huggies wipes had 4, and the Pampers had 5. So why do we list those options as relatively high on our list? Because they have great performance and passed our tests with flying colors. But if your baby has extremely sensitive skin, you might want to keep those ingredients in mind when picking the perfect baby wipe for your child. In most cases, none of the sensitive baby wipes on this list will cause any issues, as even when they contain certain ingredients they tend to be present in much lower concentrations (that's part of what makes them "sensitive"). Furthermore, none of the baby wipes reviewed on this list include any hazards greater than a 5 on the EGS 1-10 scale, and none are included in the EWG's "high hazard" category. We can't say the same about other wipes on the market. How to save some money: Driving to the store and picking up wipes, usually on a last-minute emergency basis, isn't really the best method. We suggest signing up for Amazon Mom (free trial! ), which will give you a $20 cash credit, a 20% discount on subscribe-and-pay for diapers (see our diaper reviews here), and free 2-day shipping on nearly everything you buy there. Subscribe and save is great - you pick how often you want them delivered, and you save a ton. Don't like the wipes you got? Return them for free and they will refund your credit card. Amazon is excellent for these things, and you can save a ton of money by taking advantage of these offers. Also, buy in bulk to save some cash. You'll notice that smaller packages of wipes can reach about 10-15 cents per wipe, whereas the larger packages are about half that price per wipe. Flushable? We want to point out that some wipes do indeed market themselves as "flushable" or "septic safe." These particular wipes do tend to decompose a bit more readily than others, but we want to be clear that any baby wipes can clog your toilet, pipes, and sewer main, particularly at intersections and turn points. This applies regardless of how a company markets their product. In other words, we suggest always placing your dirty wipes in the garbage, or perhaps in one of our best-rated diaper pails! Sensitivity: This is really important. When you are changing nearly a dozen diapers a day, you are also exposing your baby's bum to the chemicals and fragrances of each wipe you use. The fewer chemicals and fragrances, and the softer (less abrasive) the baby wipe, the better off you'll be. Using the best sensitive baby wipes will reduce the chances of developing diaper rash, bumps, and redness on the bum and privates. It will also make you feel better that you're not repeatedly exposing your baby to any harmful chemicals each time you clean them up.